New York City produces about 14 million tons of garbage a year, so you can imagine the energy and resources required to move and process it all. In order to tackle this issue, the folks over at Present Architecture have come up with a creative, double-duty solution called the Green Loop. Rather than trucking the city’s garbage to out-of-state landfills, the Green Loop would create a network of ten new waterfront composting hubs throughout the five boroughs. In addition to processing waste in an eco-friendly and local manner, the stations would also function as waterfront parks for nearby communities. 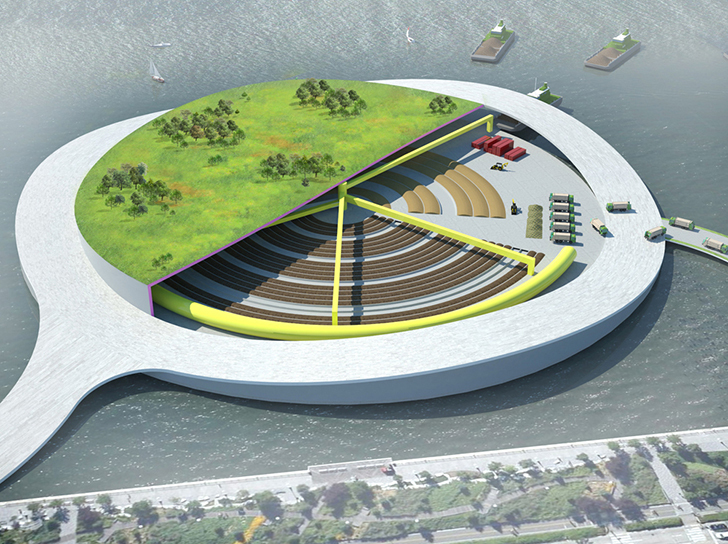 The new Green Loop facilities would be built on top of artificial islands connected to the boroughs via jetties. The concept hub stations would have street level compost centers with elevated public parks planted on top. These composting parks could process our organic waste, including 30-percent of our residential waste stream. Thanks to the parks being spread out across all five boroughs, the system would also add an element of fairness to our currently imbalanced waste management system. Instead of passing though the Bronx to reach landfills as far away as Ohio, sanitation trucks could simply drive to the closest Green Loop dumping sites. This would drastically reduce transportation miles to landfills, decreasing traffic, noise, and pollution. Not to mention the added benefits of safer streets, cleaner air, and fewer greenhouse gas emissions. At the same time, the composting hubs would create an additional 125 acres of public parkland in the city. Each elevated park is designed to be large enough for anything from educational facilities and neighborhood gardens to cross-country skiing in the winter. The added parks would improve public access to green space, esplanades, and bike paths, helping New York reach its Vision 2020 goals to build a Comprehensive Waterfront. Amazing idea. It looks like a great opportunity to also clean water by adding myceliated mats, clam or oyster habitat and or mid ball Bokashi remediation techniques to the underside of the Loop islands. Or it would make a lot of sense to attach a +Pool to some of these. Bravo Present Architecture! These new facilities would be built on top of artificial islands connected to the boroughs via jetties. The concept hub stations have a street level compost centers with elevated public parks planted on top. These composting parks could process our organic waste, including 30-percent of our residential waste stream. Thanks to the parks being spread out across all the boroughs it would add equality to our waste management system. Trucks could simply drive to a much closer local dumping site instead of passing though the Bronx to reach landfills as far away as Ohio. This would drastically reducing the transportation miles to landfills, decreasing the amount of traffic, noise, and pollution. Plus the added benefits of safer streets, cleaner air, and fewer greenhouse gas emissions. At the same time the composting hubs would create an additional 125 acres of public parkland in the city. Each elevated park is designed to be large enough for anything from educational facilities and neighborhood gardens to cross-country skiing in the winter. The project would also help New York reach its Vision 2020 goals to build a Comprehensive Waterfront Plan. The added parks will improve public access and help develop the waterfront area with parks, esplanades, and bike paths.